You are my Son; this day I have begotten you." I. THEME: All God’s promises are fulfilled by Christ. People desire to live and are afraid of death. If people must exchange all what they have for immortal life, many are ready to do so; but death is a reality which everyone has to face. People often ponder that why the desire for an immortal life is in them, but they have to face death? Lucky for man because Jesus came to provide for people the true answer: God creates people for the immortal life and He has already a plan to help people to achieve this. 1/ Reading I: What God promised to our fathers were fulfilled in Christ. 1.1/ All things that happened to Jesus were foretold in Scripture: Paul said to his audience in the synagogue at Antioch, Pisidia: "My brothers, children of the family of Abraham, and those others among you who are God-fearing, to us this word of salvation has been sent." Then, he proceeded to talk about the condemnation, the death, and the burial of Christ. (1) The condemnation: "The inhabitants of Jerusalem and their leaders failed to recognize him, and by condemning him they fulfilled the oracles of the prophets that are read sabbath after sabbath." The Four Songs of God’s Suffering Servants in the Boof of the prophet Isaiah and many other prophets illustrated this point. (2) Paul and Barnabas witnessed for the Paschal mystery: "We ourselves are proclaiming this good news to you that what God promised our ancestorshe has brought to fulfillment for us, their children, by raising up Jesus, as it is written in the second psalm, 'You are my son; this day I have begotten you.'" 2/ Gospel: No one can come to the Father except through Christ. (1) Thomas’ question: "Master, we do not know where you are going; how can we know the way?" Thomas’ question is logical because one must know the destination before he chooses the mean to reach it. When Thomas asked this question, he still didn’t believe Jesus came from heaven; so when Jesus said that he shall go back to the Father, he didn’t think Jesus shall ascend to heaven. Until he saw for himself Jesus’ appearance (Jn 20:26-28), then he confirmed his faith in Jesus by saying, “My Lord and my God!” (Jn 20:28). 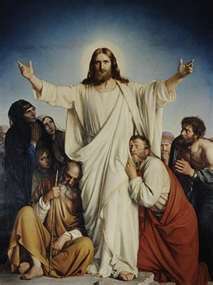 (2) Jesus’ answer: "I am the way and the truth and the life. No one comes to the Father except through me.” How can a person can declare this statement? The apostles might not understand its meaning at the time of Jesus’ saying; but only under the light of Jesus’ resurrection, they could recognize its meaning. First, Jesus revealed to men an important “truth.” He revealed God’s will for them. God doesn’t want them to die but to “live” for ever. This is the final destination of humankind, and also the goal of God’s plan of salvation. This isn’t new because when God creates man, He puts in their soul the desire to live for ever. How can people reach this destination? People can’t reach it by themselves because they are sinful and have no strength; but God prepared the plan of salvation for them. This is the “road” or the “way” which God saves men. He gave them His only Son to incarnate to redeem people’s sins. This son fulfilled God’s plan by sufferings, death and resurrection to bring about eternal life for people. - Our life is only meaningful when we put our faith in Christ. He came to reveal to us God’s will, to suffer and to die so that we can live for ever. - All events in Scripture can only be understood through Christ’s Paschal Mystery.